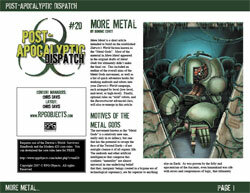 More Metal is a short article intended to build on the established Darwin's World faction known as the "Metal Gods". Most of the material in More Metal appeared in the original drafts of Metal Gods but ultimately didn't make the final cut. This included an outline of the overall aims of the Metal Gods movement, as well as a list of quick adventure hooks for working androids and robots into your Darwin's World campaign, each arranged by level (low-level, mid-level, or high-level). Finally, optional rules on "wild" robots, and the Reconstructor advanced class, will also re-emerge in this article.